In space, the hearts of astronauts become rounder. According to the scientists who have studied this phenomenon, the hearts of those who spend long periods of time in space were transformed into a shape that averaged nearly 10 percent more spherical after six months. In Minnesota recently, the hearts of moose have often faltered too soon, causing the moose to suffer a cluster of early mortality so profound that they have been wired and followed from a distance by veterinarians. When interviewed, one of the vets explained that when a moose heart stops beating, it sends a text message to their phones that says, “I’m dead at x and y coordinates,” directing them quickly to the downed animal so they have a better chance to decipher the clumsy heart. My sister, who has examined the human heart in the commonplace of gravity, has prepared herself for surgery on her own faulty heart. The doctor is a friend, the anesthetist a colleague. A volunteer for study, my sister has already been monitored a dozen ways, details of her heart and the outcomes of her surgery to become averages or anomalies. One afternoon during eighth grade, I stood with my classmates around the cow’s heart that Miss Hutchings unwrapped on her desk. Inside and out, she said, we need to know ourselves, and she halved that heart to show us auricles, ventricles, valves, the wall well-built or else. Her fingers found where arteries begin. She pressed the ends of veins. She said we were learning the circulatory system the proper way, observing firsthand. The cow’s heart Miss Hutchings displayed looked nothing like the ones that had been suggested on Valentine’s Day, during cartoons, and in art classes beginning in first grade with Mrs. McIntyre, who had us draw a sweeping arc from near the top of our red, folded construction paper down to the very bottom. “Now cut, children,” she said, “very carefully along that line and then unfold.” And though some of them were V-shaped and others looked more like balls, in a minute all of us had the suggestion of a bright red heart upon which to write “I love you” and carry home to our mothers. Previous studies have shown that astronauts are exposed to a range of health issues when taking prolonged trips into space, including losses in bone density and muscle mass and vision anomalies, but now it’s been shown that there is more to be concerned about than those problems. The rounder the heart becomes, the weaker it gets. A rounded heart is a heart at risk. And last week, in Pennsylvania, when my vocabulary for encouragement stumbled and stalled, I offered my sister the weak consolation of listening to her analyze the pros and cons of heart surgery. The muscle, she said, can regain what’s been lost. Just in case, I’ve updated my will. Three hours, on average, this operation takes, she went on, though by then I was fixed on the sort of planning that included a will revision, the summary she provided about how post-operative rehab is organized failing to adhere to the moist walls of my memory. Both of us had listened for years to our father’s reports on his aging heart. About the tempo at first, the pacemaker fresh under his skin after he’d fainted at the wheel and drifted, through luck, into a field as level as his crab-grassed lawn. Sixty, he’d say, counting the beats for a minute as if he were in training. The first time he exposed its shape near his shoulder I imagined his body penetrated by some circular alien who would, inevitably, invade his blood. After our class had inspected the cow’s heart, Miss Hutchings unwrapped the hearts of chickens and turkeys, the hearts of swine and sheep. She arranged them by size on the thick, brown paper sack, leaving a space, we knew, for ours. Richard Turner, whose father’s heart had halted, examined his hands. Anne Cole, whose father had revived to cut hair at the mall, stepped back, turning away from the entry to the steer’s aorta, the four chambers we were required to know. A long-held belief of many traditional cultures and their healers is that eating the organs from a healthy animal supports the organs of the eater. For example, eating the brains of a healthy animal supports clear thinking, and eating animal kidneys will cure people suffering from urinary disease. That logic means that the best way of treating a person with a weak heart is to feed the person the heart of a healthy animal. There are countless reports about the success of these types of traditional practices. None of them have been verified by scientific testing. “Feel this,” my father said, guiding my hand to the simple Braille of his new pacemaker. “Sixty,” he said, “over and over like a clock.” I told him about the billion heartbeats of the mammal, how the shrew had three years to live at 800 beats per minute, and the cat had twelve at 200. “We have thirty years,” I said, “because we use up 100,000 beats per day, but we get more because of science and medicine and help from how slowly we mature.” When I told him this, my father was well over eighty, closing in on three billion, and I was past two billion. 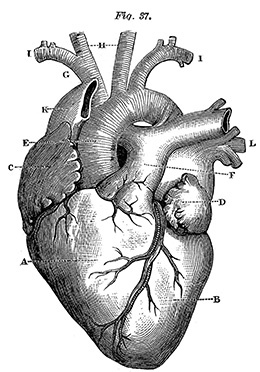 The human heart usually weighs about ten ounces, but the heart of the blue whale often weighs about 1,300 pounds. It averages about eight to ten beats per minute that can be heard two miles away. On the other hand, the tiny hearts of hummingbirds are the largest proportionate to their minuscule body weight. Their heart rate runs to over 1,000 beats per minute when they’re active, but it slows when they sleep to less than 100—a necessity, or they would starve to death before morning. “The heart doesn’t work as hard in space, which can cause a loss of muscle mass,” says the lead scientist for ultrasound at NASA and senior author of the study of astronauts’ hearts. Though the astronauts’ hearts returned to their normal, more oval shape, shortly after their return to Earth, what’s left to learn is whether there are serious, long-term consequences, something that can’t be known for years. I looked forward to the ritual of tiny candy hearts being shared at the Valentine’s Day parties we had in grade school. Love You Much, it said in blue letters on the pink candy. Be Mine was repeated in red letters on pale blue hearts. From fourth to sixth grade, I looked at Susanna Frank or Nancy Harris or Kathy McMichaels each time I swallowed one, sending sign language their way. The ultrasound pictures of the long-term-in-space astronauts’ hearts are stunning. The hearts look as if they’ve been molded like clay, becoming so round they appear to be incapable of working. It doesn’t surprise me to learn that astronauts often get lightheaded and faint upon standing when they return to earth because of a sudden drop in blood pressure. I think of my father, hospitalized at last, admitting he had, despite the pacemaker, fainted twice when standing, the third time after bending to place his ball on a tee at a public golf course. Despite my father’s protests, his friend had called an ambulance. Within a week he underwent his second heart repair, this time triple bypass surgery. The day after we looked at animal hearts, Miss Hutchings asked us to take our pulses. Using the stethoscopes she’d brought to class, we listened to each other, boy to boy, girl to girl, because of the chance we’d touch. The images of those butcher hearts faded while I dreamed of pressing my ear to the rhythmic hearts of Sharon Rolfe and Janelle Fisher, whose breasts, so far, had brushed me a few times while dancing. And then Miss Hutchings recited the quart total of our blood, the distance it must travel, leaving and returning. We learned all of the names for the routes it followed, ending with capillaries so close to the surface I understood, though she didn’t say it, we could nearly reach them with our lips and tongues, rushing the blood to each of the sensitive sources for joy. The sugar Valentine’s candy I loved in grade school are called “conversation hearts” in the ads for them on the Internet. They come in two sizes—small and large—but both kinds still feature the familiar messages from my childhood: Marry Me, Sweet Talk, Darling, all of the speaking hearts in pastel colors, three pounds for $15.76. And colorful, decorated heart-shaped boxes in multiple sizes that contain those heart-shaped candies, the packaging suggesting a truncated Russian nesting doll. A woman named Mercy Brown was once exhumed for public autopsy. The people in the town in which she had lived believed that a local cluster of consumption might be worsened by those who had died from that disease, but it could be bettered by burning the uncorrupted heart of the victim. Not only might there be an end to an epidemic, there was a chance, people said, that her brother Edwin might be cured of his tuberculosis by eating the ashes of her heart. Mercy’s father had to watch his daughter be raised from the grave after being months buried. He had to endure the burning of her heart. Edwin, at last, swallowed the ashes, but he died, regardless, in two months, leaving his father to live alone and remember his daughter being twice buried. This happened in Vermont in 1892. Mercy Brown was also thought by many to be a vampire. The rounding of the heart could mean trouble for people who want to embark on long-term missions to Mars. Astronauts currently spend up to six months at the orbiting International Space Station, which is staffed by rotating crews. Missions to Mars would take about eighteen months and may offer no return trip. As if she wants me to be convinced her upcoming operation is routine, my sister tells me our cousin has undergone his third operation, that he has flown from Virginia to a Texas hospital for the latest surgery. So thin, she says, his pants want to fall down, his shirts hang like curtains, reminding me how, every late August, my mother held up what he’d outgrown, what I’d grow into, dressing me for school and church for a year, two if we were lucky, teaching the lesson of the threadbare, the ill-fitting and the out of style, learning what was good enough. He’s still standing on his own two feet, my sister says, wearing her hand-me-down language, adding he’s in our prayers and he’s a fighter like a litany, like I should say amen or sing the Doxology before a recessional hymn of hope. My sister, who learned to sew her own clothes, who wore homemade, but new, who needed to perfect the careful cut and stitch because she was older than every female cousin, declares, “Our time will come,” like some minister for fatalism. She’s at the window of the spare room where I’ve slept, saying the weather, so sunny and mild, is heavenly while I try to ignore the sewing machine, the half-finished skirt and the thick file of patterns collected in the good light I have to tear my eyes from. Is it safe to eat a fresh raw moose heart? Now it is understood that in order to keep the heart healthy in space, astronauts must know the amount and type of exercise they need to perform to guarantee their safety on prolonged spaceflights. It’s been suggested that exercise regimens developed for astronauts could also help people on Earth who have physical limitations also maintain good heart health. Those models could also give doctors a better understanding of common cardiovascular conditions for ground-based patients. During the last years of his life, as he approached ninety, our father wore sweaters even in summer. So cold, so often, he kept the windows shut in his un-air-conditioned house. He would probe for his pulse, reporting, “Still there.” After that small, brief joke, he’d wait five minutes, sometimes ten, before listening to his wrist again, head bowed, leaning forward, as if he needed to coax a heartbeat with prayer. When I attended my fiftieth high school class reunion recently, there was a large poster that was labeled “In Memoriam.” It listed those from my class who had died, a bit reminiscent of the Vietnam Memorial, complete with a few small, impulse tributes of programs and table favors laid beneath it. Sharon Rolfe and Janelle Fisher, I discovered, had each been dead for more than twenty years. Except for our war dead, causes weren’t listed, but like all the others, their hearts had stopped. In the midst of writing this essay, I take a heart- age test and learn my heart is a year younger than my age but I have a twenty-two percent higher-than-average risk of problems in the next decade. I remind myself that I’ve lowballed my answers, that this is a worst case scenario, but there’s no denying my mother’s heart failure when she was younger than I am, my father’s bypass and pacemaker, my sister’s impending open heart surgery. There is an Animal Planet TV show about humans getting animal parasites. You stand a good chance of being their next guest star. If you want to take the chance, it’s your body. Everything points to a glass or two of red wine being heart-helpful, but I drink only white wine and even then only rarely, preferring beer. There is evidence that hearty laughter is good for the heart, but I seldom laugh out loud. I blame it on my family history, all those dour Germans drinking beer and frowning until they tumbled with heart attacks and strokes. There seems little question that eating organ meats has fallen out of favor among people I know. I tell them that liver, kidney, and heart are some of the most nutrient-rich foods you can eat, but there aren’t any takers. At the grocery store, when I look for veal or lamb kidneys, there are none, and when I settle for a package of chicken hearts, the clerk goes “Eeew!” and acts as if she’ll pass it through without ringing it up just to avoid touching it. Even when, in the assisted living home, my father stopped watching television, when he slept twelve hours a day and napped three times, his fingers went to his wrist as he woke, repeating, “Still there.” Even when he gave in to the wheelchair. Even when half his weight vanished although he ate, like always, everything that was served. Even when his sentences turned shorter, the ends lost like addresses, phone numbers, and the names of the dead, his fingers returned to his wrist to read the braille for “still there,” while I waited, despite reason, holding my breath for his up-to-the-minute news. This morning, the day of my sister’s surgery, a waitress spread whipped cream into the shape of a thick, valentine heart across my son’s banana-walnut pancakes. She did it carefully, making sure, she said, you know it’s a heart and not a circle, so unashamed of her public sentiment, her heavy body turned delicate in the sweetened air. All this afternoon I regret the impossibility of omniscience. And yet I am thankful. At last, from the nearby table, my phone sings its song of incoming text. And though the news, this time, is good, in the altered atmosphere, I believe our dependable, dangerous hearts are becoming spheres. Gary Fincke is the Charles B. Degenstein Professor of English and Creative Writing and director of the Writers Institute at Susquehanna University.